Complete Containment For 275 Gallon Oval Tanks - Indoors Or Outdoors! Eliminate costly spills while storing fuels, oils and other hazardous liquids. Rugged, all-polyethylene construction will not rust or corrode. Meets EPA Container Storage Regulation 40 CFR 264.175. 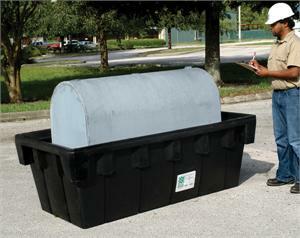 Pull Over Cover option keeps rainwater out, yet allows easy access for pumping waste collection. Also available for 500G./550G. and 1000G. tanks. Click here for more information.